June 14 1865 -The Antietam Cemetery. 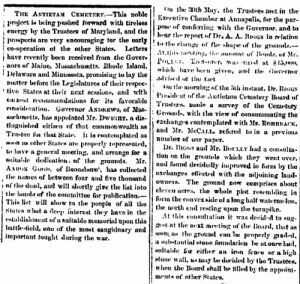 (Cemetery Trustees encouraging support from state governors). This noble project is being pushed forward with tireless energy by the Trustees of Maryland, and the prospects are very encouraging for the early co-operation of the other States. Letters have recently been received from the Governors of Maine, Massachusetts, Rhode Island, Delaware and Minnesota, promising to lay the matter before the Legislatures of their respective States at their next sessions, and with earnest recommendation for its favorable consideration. Governor Andrews, of Massachusetts, has appointed Mr. DWIGHT, a distinguished citizen of that commonwealth as Trustee for that State. It is contemplated as soon as other States are properly represented, to have a general meeting, and arrange for a suitable dedication of the grounds. Mr. Aaron Good, of Boonsboro’, has collected the names of between four and five thousand of the dead, and will shortly give the list into the hands of the committee for publication. This list will show to the people of all the States what a deep interest they have in the establishment of a suitable memorial upon this battle-field, one of the most sanguinary and important fought during the war. On the 30th May, the Trustees met in the Executive Chamber at Annapolis, for the purpose of conferring with the Governor, and to hear the report of Dr. A. A. BIGGS in relation to the change of the shape of the grounds.— At this meeting the amount of bonds of Mr. Boullt, [?] at $15,000 which have been given, and the Governor advised of the fact. On the morning of the 5th instant, Dr. BIGGS, President of the Antietam Cemetery Board of Trustees, made a survey of the Cemetery Grounds, with the view of consummating the exchanges contemplated with Mr. ROHRBACK AND MR MCCALL, refered to in a previous number of our paper. Dr. BIGGS and Mr. BOULLT had a consultation on the grounds which they went over, and found decidedly improved in form by the exchanges effected with the adjoining landowners. The ground now comprises almost eleven acres, the whole plot resembling in form the convex side of a long half watermelon, the north end resting upon the turnpike. At this consultation it was decided to suggest at the next meeting of the Board, that as soon as the ground can be properly graded, a substantial stone foundation be at once laid, suitable for either an iron fence or a high stone wall, as may be decided by the Trustees, when the Board shall be filled by the appointments of other States.